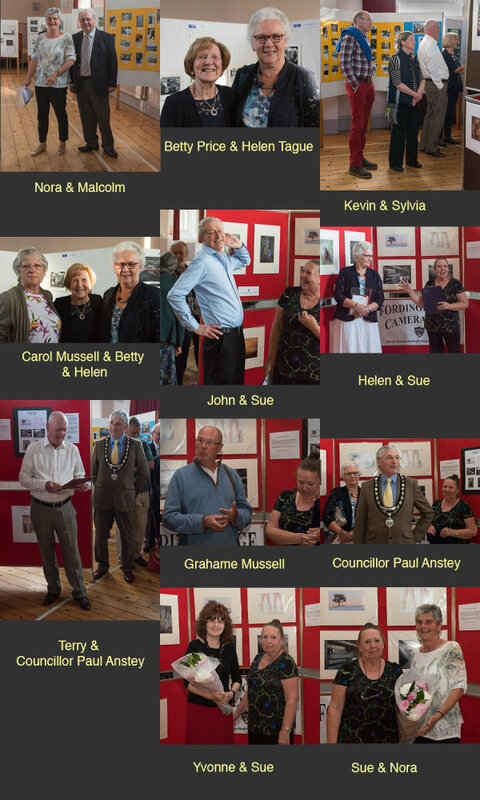 The 60th Anniversary Exhibition was held Thursday 17th May to 19th May 2018 in the Town Hall. The exhibition was a great success with about 300 visitors. The Thursday reception had visitors speaking about founder members and the club history. The event was opened by the Mayor, Paul Anstey. The public were asked to vote on their favourite images and the results were. Salisbury Journal report filed by David Fletcher. FORDINGBRIDGE Camera Club has celebrated its 60th anniversary. Fordingbridge Camera Club was formed in 1958 by a group of photography enthusiasts. To mark the milestone a special exhibition was held last week, which was open by the mayor of Fordingbridge, Councillor Paul Anstey, who is pictured with the-chairman of Fordingbridge Camera Club Sue Veal. Cllr Anstey said: "On behalf of the council and of Fordingbridge I congratulate the Club on its 60th anniversary and on presenting an amazing exhibition. The standard of members' photographs is quite stunning and the entries from the youth groups are inspirational. I wish the club every success in their future." To celebrate its 60th anniversary the club held an exhibition in Fordingbridge Town Hall of photographs, cameras and memorabilia. Club members visited local Beavers and Brownies groups to talk about photography, and their work is displayed together with that of pupils of Forres Sandle Manor school. The club members' work exhibited includes photographs which have been successful in regional competitions organised by the Southern Counties Photographic Federation (SCPF)and the Stour and Avon Photographic Association (SAPA). Each member was also invited to display their favourite image from among their own work, together with a brief explanation of why they chose it. The club's deputy chairman said: "I am delighted that the exhibition has been successful and raised the profile of Fordingbridge Camera Club. It's great to see the participation of young people from a range of local organisations displaying such excellent photographs - laying the foundations for our budding photographers of the future." Meetings are are usually held at 7.30pm on Wednesdays from September through to June at the Avonway Community Centre in Shaftesbury Street. There are practical photography evenings and talks by guest speakers and members. Fordingbridge Camera Club is affiliated to the Southern Counties Photographic Federation (SCPF) and to the Stour and Avon Photographic Association (SAPA).